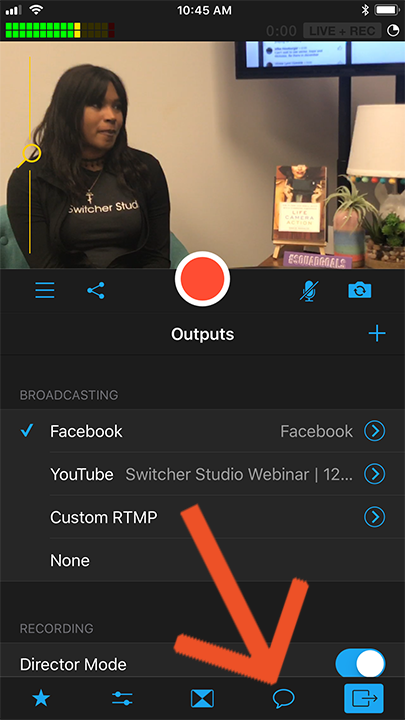 When using Switcher Studio on your phone, you have the option to use the phone either landscape (horizontal) or portrait (vertical). Both will produce horizontal video. When using the phone in the vertical mode, we can view Facebook comments. First, you will need to create a Facebook Live event on your phone. Click the link below for more information on setting up Facebook inside the Switcher app. Once you have your Facebook stream connected, you will see a chat icon appear at the bottom of the screen. Tap on that icon. After you start your Facebook live stream, comments will begin appearing in that tab.